This is the third installment of The MMQB’s “24 Hours” series, inside-inside, multimedia stories for the 2017 NFL season, chronicling a day in the life of an important figure in pro football. 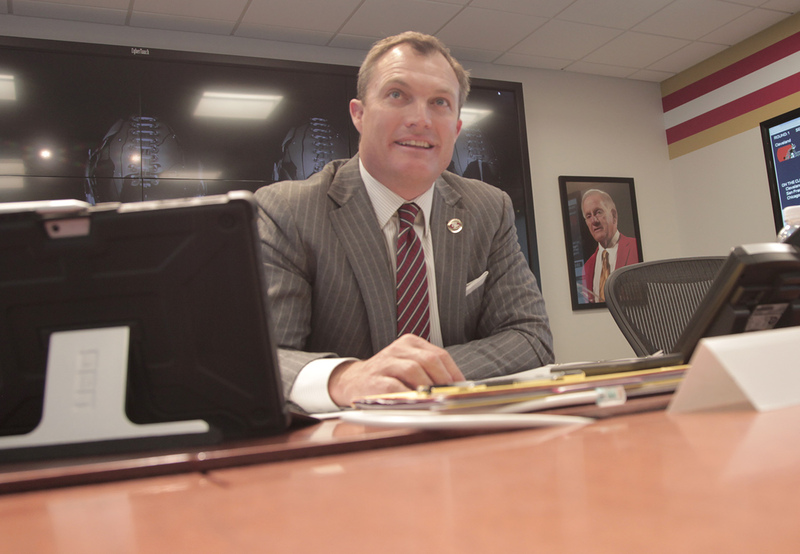 This one is a view into the world of John Lynch, rookie general manager of the San Francisco 49ers, on the first draft day of his executive career. Lynch, 45, played 15 seasons in the NFL as a safety and made the Pro Bowl nine times. After a nine-year stretch as an analyst for Fox, he was named GM of the struggling 49ers on Jan. 29, joining fellow first-timer Kyle Shanahan, the head coach, in trying to return the Niners to their glory days. Though Lynch had never been a scout or worked in football management, the Niners are counting on him and Shanahan to quickly rebuild a team that was in the Super Bowl just four years ago—but has gone 7-25 over the last two seasons. So the first day of the 2017 draft was a big day for Lynch. Very big. “It’s a feeling like I had the day I played in the Super Bowl—it’s that important,” Lynch said a few hours before the draft kicked off on April 27. His day kicked off, actually, much earlier than he would have liked. Those are Lynch’s first thoughts on a very big day. He wakes up in the Santa Clara Marriott, in the expansive room that has been his residence for two months while wife Linda and his four kids remain at home in San Diego. Six hours of sleep is not going to be enough. He hoped for eight. He needed eight. John Elway, his mentor in the business, had the biggest piece of draft-day advice for him, and it had nothing to do with football: Nothing much happens the day of the draft until the draft, so be sure to be rested. Lynch gives it 15 minutes. He closes his eyes in the dark room. He tries to relax. No dice. I’m just faking it, he thinks. His mind is racing. He takes another note card. And so on. The “2” is Lynch’s first-round draft slot, and the first card notes who he’d pick if he doesn’t trade the pick; the second card notes his draft priorities if he trades down with Chicago at three, which is likely. In order, the pick would be Stanford defensive lineman Solomon Thomas, and if he’s gone, Alabama linebacker Reuben Foster. He writes out a couple of other cards, including “2 to 12,” in case the Niners work out a deal on the clock to trade down with Cleveland at 12. Busy work. After a while, Lynch lies down and tries to get another hour of sleep. Too many thoughts, like, Who do I believe? It’s significant that Lynch knows what Cleveland will do with the first overall pick. For weeks, he’d assumed the Browns would take pass-rusher Myles Garrett. Late yesterday, that seemed in doubt. “John [Elway] called,” he says, “and he told me, ‘This thing might be going the other way’” to quarterback Mitchell Trubisky. Lynch wants to see Trubisky go No. 1. That would leave the Niners with two pretty good choices—taking the top player on their board, Garrett, with the second pick; or trading it for “a ransom,” as Lynch says. Truth be told, he’d probably trade it … if he could get a bevy of picks, including an additional first-rounder in 2018. He knows he and his team will have to weigh some heavy options late in the afternoon if Garrett is there. But just before he went to sleep, Lynch got a text from someone he trusted saying Cleveland coach Hue Jackson would be shocked if the pick was Trubisky. Now, as he lies there, fruitlessly trying to sleep, the GM of the 49ers has a good feel for what he thought would happen with the first pick. But he truly doesn’t know what awaited him half a day from now, in the biggest decision he’d make in his rookie year. Advice from all my new GM friends? "Get some rest, it's a marathon." Yea right! I've been up since 3:30 AM. Let's do this already! Peters, the personnel czar Lynch hired away from the Broncos, calls with some intel. He’s heard reliably that Cleveland owner Jimmy Haslam has met with Hue Jackson, and the decision has been made: Cleveland is picking Garrett. If true, that’s a bit of a bummer. No ransom for the pick now. Lynch isn’t feeling down. He didn’t expect Garrett to be there at two anyway. “Garrett’s just too good,” Lynch says. Elliott Williams, the 49ers’ director of functional performance, knocks on Lynch’s door. Under Lynch, the Niners are big into movement and stretching, and not just strength and cardio. Now, the first of the GM’s three workouts on the day commences. “I need to burn off some energy,” Lynch says. For a guy who was supposed to be pretty beat up at the end of his 15-year NFL career, Lynch stretches like a pretzel and looks like, if he didn’t do the GM thing, he’d be a good personal trainer. He keeps an eye on ESPN’s “Mike and Mike” on TV, where the consensus is that Cleveland is going Myles Garrett, and San Francisco is going to have the pick of the rest of the board. The workout wraps up, but before he leaves his room for a 1.7-mile jog to his office adjacent to Levi’s Stadium there’s one last order of business: the cheese plate, an amenity from the hotel. This is some aged cheese under the cellophane, ignored by Lynch for two months. “I guess I’m really not going to eat it,” he says, and places the tray outside the door. • 24 HOURS WITH PATRICK MAHOMES: Before he became the Chiefs’ QB of the future, the Texas Tech had to prove himself at his pro day. We went behind the scenes for his pressure-packed preparation. Jogging from the Marriott to Levi’s Stadium, via the San Tomas Aquino Trail, Lynch multitasks. Lynch's morning run from hotel to office, phone in hand. A plane from San Jose International Airport, a few miles away, roars overhead. As the decibels die down, Lynch puts the phone to his ear. “Hey man, what’s going on?” Shanahan responds. He takes a couple of breaths. Plus, the only one of Lynch’s children who remembers much about what he did as a player is his son Jake, a high school junior. As Lynch runs, he explains why he had to take this job and why, at the same time, it’s a bit tormenting. “It really wasn’t the ideal time,” Lynch says. “Kids in high school. That’s hard. I struggle with that. I’m away from them. It’s really hard. We’re a close family. But even they said, ‘Dad, you’re too excited. Go for it.’ And I think in some ways it’s good for them too. They can see something important about life. 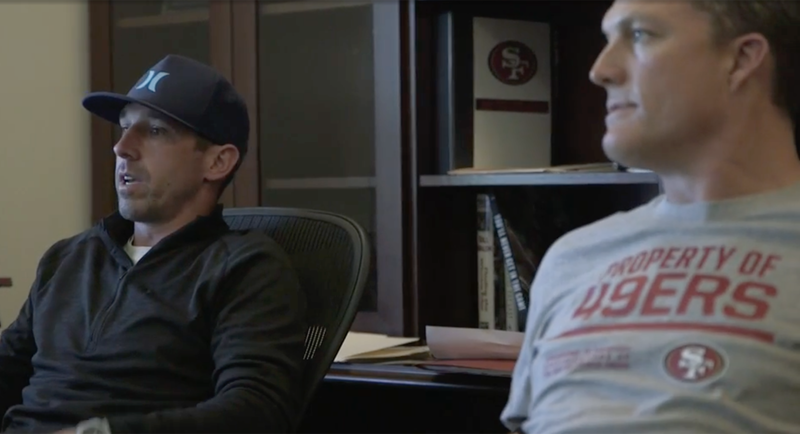 Lynch and Shanahan savor a couple of hours together uninterrupted in the coach’s office on the first floor of the Niners’ football building, making sure they agree on the draft plan. They start by going over Lynch’s cards. • There’s an offer on the table from Bears GM Ryan Pace for Chicago to trade the third overall pick, plus third-round picks this year and next year, for the Niners’ first-round pick, No. 2. • If they pick Foster at three, the Niners have some assurance that the agents for Foster will put contingencies in the contract to cover some of the off-the-field risks he presents. Foster tested positive for a diluted drug sample at the scouting combine, meaning there may have been an attempt to drink enough water to hide a positive drug test. And Foster flipped out on a hospital employee over the extended wait for combine medical tests in March; he was expelled from the combine for that. “They [Foster’s agents] are all in on that if we pick him up here,” Lynch says. • The rest of the time in Shanahan’s office—Marathe leaning against the window looking out onto the practice fields, Shanahan at his desk, Lynch seated in the middle of the room, and Peters seated behind Lynch—the GM throws out ideas, as does everyone else. The most experienced man in the room, Marathe, is in his 17th draft with the team. He knows the cap, and he knows the value of picks on the trade market. This is the crux of the draft. This is what 31 other organizations are doing right now, in one form or other. This is the debate Lynch needs to have in the hours before the draft, so the team can walk into the draft room unified, and so he can be comfortable knowing, generally, what he’ll want to do depending on whether he moves back or moves up. Or what he’ll think about any one of a number of offers he thinks he could get while on the clock tonight. 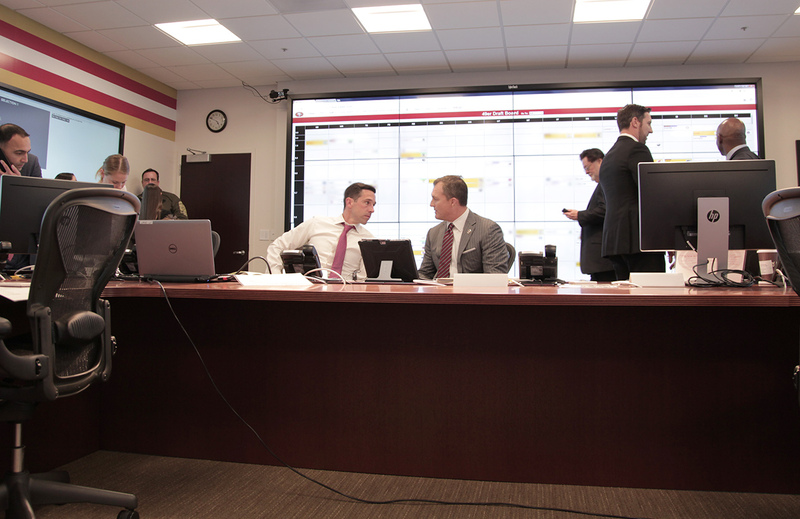 Shanahan and Lynch did more cramming on prospects hours before the draft. The 49ers hold two and 34. No one in this room believes the team will stand pat with either of its picks in Rounds 1 and 2. Moving from 34 to the area around 21 is important, they think, because one of their targets should they deal down from two to the area between eight and 15 could be there: running back Christian McCaffrey, wide receiver John Ross, edge rushers Charles Harris, T.J. Watt or maybe Takkarist McKinley, and perhaps a wild card. “I think Jabrill Peppers has to be in the discussion there,” Lynch says. Watt is on the floor again, before the group breaks for lunch. Lunch (omelet, bacon, fruit). Workout. Meeting. Short workout. Lynch just wants to get this going. • 24 HOURS WITH ADAM SCHEFTER: We went behind the scenes with the NFL’s top news-breaker for the whirlwind first day of 2017 free agency. Lynch gathers CEO Jed York and his father, co-chairman John York, and Shanahan and asks them to come into Jed York’s office. He sees Jed’s twin sisters, Jenna York and Mara York, who don’t have titles with the team but are in for the draft, and invites them too. “We’d like you to hear our plan,” Lynch begins, and he lays it all out. The crew likes the trade from two to three. Shanahan and Lynch discuss strategy while Marathe (left) works the phones and Peters and Mayhew (right) review the board. Lynch’s office is across the hall from the John McVay Draft Room (McVay was the GM under Bill Walsh), and an hour before the draft, he puts on the suit his wife picked out for such a momentous occasion: gray pinstripe suit, white shirt, white pocket square, black loafers. (Jed York picked out the tie: 49er red, with narrow white stripes). Lynch feels something in his breast pocket. It’s a card, from Linda. He’s used to this. She surprises him with cards often. Walking into the draft room, minutes before the draft kicks off in Philadelphia, Lynch is calm. Shanahan too. “Ready,’’ Lynch says with a smile. “Just like I was at 3:30 this morning.” They’d just come from a meeting in his office, during which Lynch directed Marathe to try to get one more thing out of the Bears. Chicago threw in a fourth-round pick in addition to the two third-round picks, with the proviso that the 49ers would only make the deal with the Bears if Garrett is the first overall pick. If Garrett is there at two, the auction would commence and the Niners would either take a monster deal, or the monster pass-rusher. There are 31 people in the room. 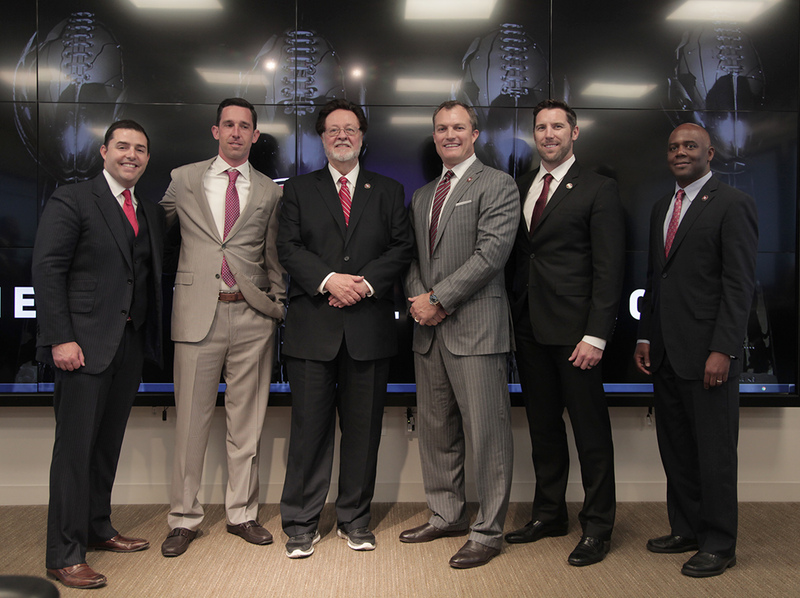 The brain trust (Marathe, Jed York, Shanahan, Lynch, Peters, Mayhew, John York) from right to left at the front of a three-sided table about 27 feet around. Scouts along either side. Medical staff and some coaches on the inside, and minority owners and two fans who’d paid $30,000 each to the 49ers foundation sitting silently in back. • TRUBISKY HAD NO IDEA THE BEARS WERE DRAFTING HIM: How Chicago relied on stealth to get its quarterback of the future. The Browns pick Garrett. Lynch’s expression doesn’t change. Niners on the clock, Lynch on the clock for the first time in his life. The Niners wait to be sure no team calls with a ridiculous offer now that Garrett is gone. Three minutes later, Marathe okays the deal with Chicago, and both call the league to confirm. Chicago is on the clock. When the trade is announced on NFL Network (TVs in the room are tuned to ESPN and NFL Network; the sound is up on the NFL’s channel), there’s an “Oooooooh” from the crowd in Philly. Lynch’s expression doesn’t change. Marathe phones six teams in the top half of the draft that he thinks might have some interest in the third pick. “New Orleans, Carolina, Cleveland, Philly, Jacksonville all said no,” Marathe announces. Chicago will pick, and then San Francisco. “TRUBISKY!” says Lynch. His expression does change now. Chicago shocked the draft. No action for the third pick now. Lynch waits. But the market was for Garrett, and Chicago made a market for Trubisky. This is all Lynch can think about now: Be happy. You’re getting the guy you wanted at two, and you picked up two threes and a four for nothing. And you know no one was paying a ransom for Solomon Thomas. Garrett yes, Thomas no. “Turn the card in,” Lynch says. The room is remarkably calm and unemotional, even though a tremendous piece of good fortune just fell into their laps. If Thomas got picked second, by Chicago, the pick would have been Reuben Foster. And though Foster plays the game the way Ray Lewis did, picking him at three, with the injury and personal concerns surrounding him, would have gotten the Niners bashed over the head for days. Someone gets Thomas on the phone, from the site of the draft in Philadelphia. Lynch picks up the landline. A couple minutes later, with Thomas off the phone, Lynch turns to the room. Ten to 15 seconds of clapping and a couple of whistles. Lynch looks down at his phone. “Brilliant trade,” reads one text from Falcons assistant GM Scott Pioli. “Great trade,” reads another from Mike Tannenbaum of the Dolphins. Lynch looks up. “Had Solomon been gone, we’d have gone Reuben. And been happy,” he says. In most drafts, the action dies down after your pick. But a funny thing is happening in this draft. No one wants Reuben Foster. Cincinnati liked him; the Bengals pass at nine. New Orleans liked him; the Saints pass at 11. Washington (17), Detroit (21), Miami (22), Oakland (24) … all pass. Lynch is undeterred that the league is treating Foster like he has a communicable disease. Marathe and Mayhew and Peters and even Lynch call teams, trying to see if they can steal a pick to take Foster. Before Baltimore picks at 16, Marathe gets solemn with Lynch and Shanahan. “Would you do our two, a three and two fours to get this pick?” Marathe says. Shanahan looks at him like’s got two heads. “I wouldn’t do more than a two and a three,” Shanahan says. Lynch is O.K. with splitting the baby: offering a two, three and four for the 16th pick. That would leave San Francisco with no second-round pick, one third-round pick and no fourth-round pick. So Marathe offers the two, three and four to GM Ozzie Newsome of the Ravens. “Ozzie came back with our two and 66 and 67,” Marathe says. In other words, San Francisco’s two and both threes. “Tomorrow’s the best day,” Shanahan says. Marathe gets up to leave the room. He practically bolts. “Don’t go far,” Lynch warns. Marathe is gone for maybe 100 seconds. He walks back in the room and announces: “I hear Washington wants to trade down.” False alarm. Marathe offers Washington, at 17, the Baltimore deal. Washington sticks and picks another Alabama faller, defensive tackle Jonathan Allen. Amenable. Now there’s a Stanford word for you. Reese must have said no. Tight end Evan Engram goes to the Giants. Marathe has been talking trade for 97 minutes, and Foster is still sliding. Finally, a deal is struck. With 19 seconds left in Seattle’s slot at 31, the teams confirm to the NFL that San Francisco will send 34 and 111 to Seattle for the 31st pick … and the teams get the trade done moments before New Orleans at 32 would have jumped in to pick Foster. This is the way the draft works: When a team’s 10-minute period in the first round is up and a card has not been turned in with a player’s name on it, the next team in the queue is on the clock. Theoretically, if the Saints had been standing at NFL draft command with Reuben Foster’s name on the draft card and been ready to hand it in, the Saints could have trumped San Francisco and picked Foster. Nineteen seconds. That’s all that stood between the Niners drafting Foster and potentially losing him. Knowing it’s a done deal, Lynch gets on the phone with Foster to tell him the good news. The call between Lynch and Foster has been well-documented, but here’s what you might not know: Foster is watching the draft on TV at a draft party, and the TV is slightly behind the real action. Lynch is trying to convince Foster that it’s the 49ers on the clock, not Seattle, and he’s trying to convince Foster that it’s going to be San Francisco, not Seattle or New Orleans, that is about to become his NFL team. Foster, on the phone, sounds pained. “It’s too late coach!” Foster says. “No, you’re gonna be a Niner!” Lynch says. Finally, Lynch convinces Foster—a Niners fan as a kid and a fan of star Niners linebacker Patrick Willis in high school—it’s real, and Foster brightens. Rarely, if ever, does a team stay in full attention mode for nearly four hours of Round 1. But that’s what these Niners did. For the first and only time all night, the emotion is released. Lynch, off the phone, hugs every scout and coach and owner in the place. Everyone hugs everyone, in fact. “What shoulder!” Ferguson hollers back, and more laughter ensues. • MYLES GARRETT DOES DRAFT DAY HIS WAY: The No. 1 pick spent draft day in his Texas hometown with family, best friends, old coaches, a couple of NFL legends and Guitar Hero. It’s a ghost town inside Levi’s Stadium. The draft has been done for two hours, the parties have been dispersed, and here, around a circular table in a private room in Michael Mina’s Bourbon Steak and Pub restaurant, sit the men who ran the show in the draft room: Lynch, Shanahan, Peters, Mayhew, Marathe, Jed York, president Al Guido and media VP Bob Lange. And so one Read Option, which is quite a drink (Hakushu 12-year-old single-malt Japanese whisky, Canton ginger, yellow Chartreuse, pomegranate, lemon, agave), leads to another. And the men pick at a buffet of coconut lime shrimp ceviche, Ahi tuna poke, Moroccan spiced lamb pita and chimichurri skirt steak. “What are you feeling?” someone asks Lynch. “Reuben’s gonna bust a lot of coverages,” Shanahan chimes in. Back at the hotel, Lynch lies down. Day over. He’s got nothing left. He feels like he’s just played a game—a 20-hour game that started before the sun came up that morning. He’s dying to sleep, and to get more than he got last night. Whatever way it goes, it’s down in history now, is his first thought. His second thought calls to mind Robert Redford’s character in The Candidate, after he stunningly wins an election he never expected to win.